On 1-27-2019, SAPD officers handled a carjacking incident that occurred at Windsor Park, 2915 W. La Verne Ave. Two male suspects and a female suspect who was armed with a handgun took the victim’s vehicle at gunpoint. On 1-28-2019, a male later identified as Alberto Beltran (30) was captured on camera dropping the victim’s vehicle off in the 300 block of S. Sullivan. He was then observed getting into the pictured gold Acura and fleeing the scene. On 2-14-19, Suspect Beltran who had been identified as one of the three suspects involved in the 1-27-2019 carjacking was arrested by SAPD Patrol Officers. SAPD Robbery Detectives are releasing pictures and video of the gold colored Acura, which was observed in the video picking up suspect Beltran as he dropped off the victim’s vehicle in the 300 block of S. Sullivan. Detectives believe the same vehicle may have been involved in the original carjacking and was possibly driven by one of the outstanding suspects. The outstanding female suspect is described a Hispanic, 20’s, heavyset, dark-skinned, possibly multiple tattoos on her left arm and wearing glasses. She was armed with an unknown type of handgun, which is still outstanding. The additional male suspect is only describes as a male Hispanic in his 20’s. Detectives are looking for assistance in locating the gold colored Acura and information on its owner. 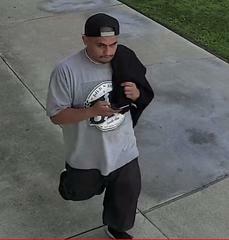 Anyone with information is asked to contact Robbery Detective Prewett at DPrewett@santa-ana.org or 714-245-8323.